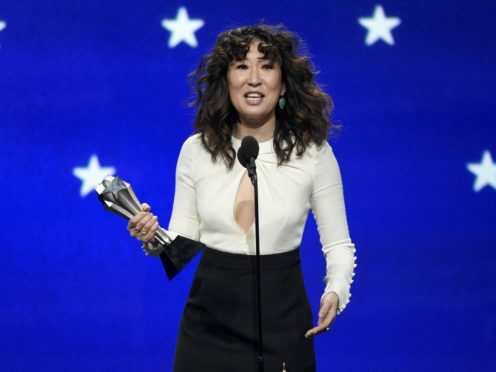 Sandra Oh picked up the best actress in a drama series prize at the Critics’ Choice Awards and paid tribute to her Killing Eve co-star Jodie Comer. Fresh off her success at the Golden Globes earlier this month, Oh, 47, took the award ahead of a star-studded field which included Liverpool-born Comer, 25. Maggie Gyllenhaal (The Deuce), Elisabeth Moss (The Handmaid’s Tale), Elizabeth Olsen (Sorry For Your Loss), Julia Roberts (Homecoming) and Keri Russell (The Americans) were also nominated. In the BBC’s spy drama Killing Eve, Oh plays MI5 agent Eve Polastri who becomes obsessed with notorious assassin Villanelle, portrayed by Comer. The pair have won critical acclaim for the show and while accepting her award in Santa Monica on Sunday, Oh singled out her co-star for special praise. She said: “There’s one person who is my obsession, my other half. The person who’s pushed me to the limit and that is the incredible Jodie Comer. Comer reacted by smiling in the audience. Killing Eve is set to return for a second season in April.